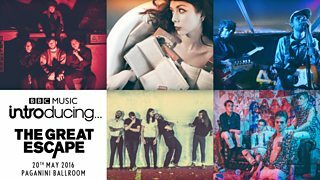 Tonight on BBC Radio 6 Music Steve Lamacq announced the BBC Introducing line-up for The Great Escape 2016. We are particularly excited about our showcase at this year’s festival, as it has been curated solely by Steve himself – an exciting development from previous years! The Great Escape is one of the UK’s most prestigious and exciting festivals for new music, showcasing upwards of 450 emerging artists from all over the world in more than 30 venues across Brighton. Attended not only by huge numbers of music fans but also by the world’s music industry, it is a chance to see your favourite new artist in intimate venues before they go on to headline major festival stages. Steve Lamacq will head to Brighton with the BBC Introducing team on Friday 20th May, where he will present a special edition of his 6 Music show between 4:00-7:00pm before heading down to the Paganini Ballroom on the Brighton seafront to host the showcase which begins at 7:30pm. Unable to attend the festival? Fear not! Tracks by each artist will be recorded and broadcast on Steve Lamacq’s 6 Music show as well as the BBC Introducing local radio show network the following week. We'll also be covering the event via our social media channels (Twitter, Facebook, Instagram) and sharing photos from the event the following day on our website.